This post took me days to write! I am still shocked at the amount of activities we did on this day. Let’s get right into it. The inverted pyramid – This is actually outside the Louvre in the Carrousel du Louvre, the museum’s underground mall. You may recognize this from the end of the Da Vinci Code. Robert Langdon finds the Holy Grail under the pyramid next to the Virgin Records. 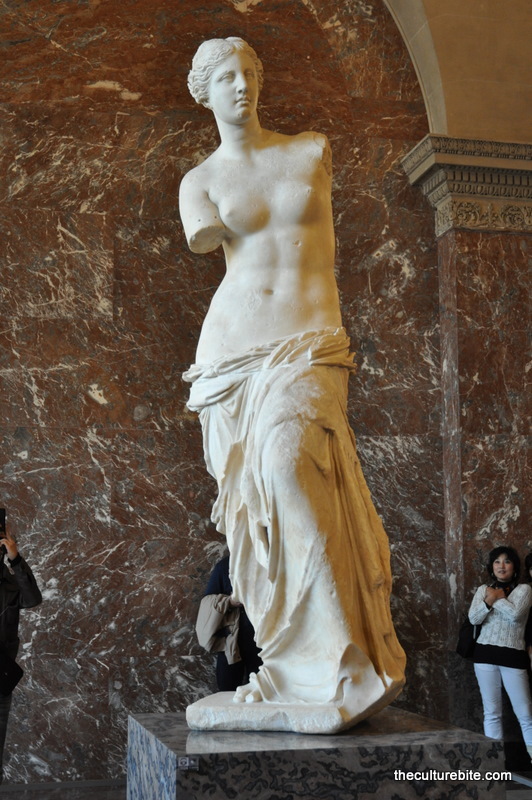 Venus de Milo – This is one of the most famous sculptures from ancient Greece. It is believed to be of Aphrodite, but experts are still unsure. The fascination of this piece is that it’s history is mysterious. No one knows the artist, who it is depicted of, and what her arms may be doing in the sculpture. Winged Victory – The Winged Victory is one of the most famed sculptures in the world. 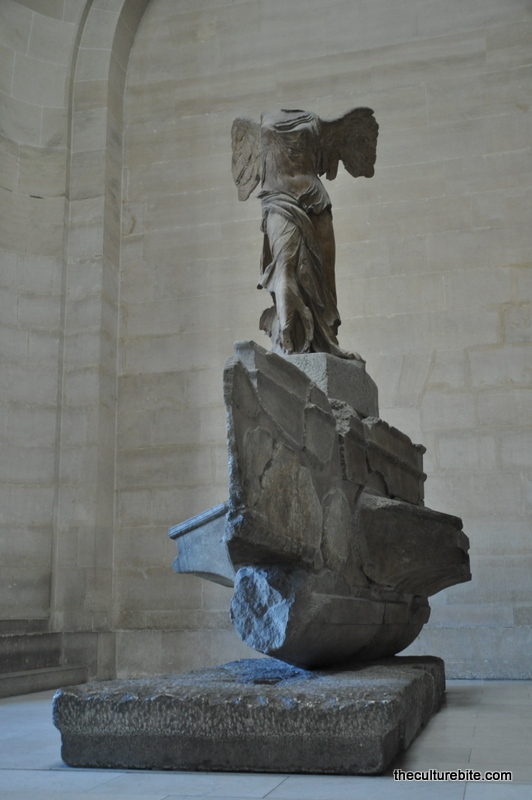 The sculpture of the Greek goddess, Nike of Samothrace, was constructed in 190 BC to honor a sea battle. 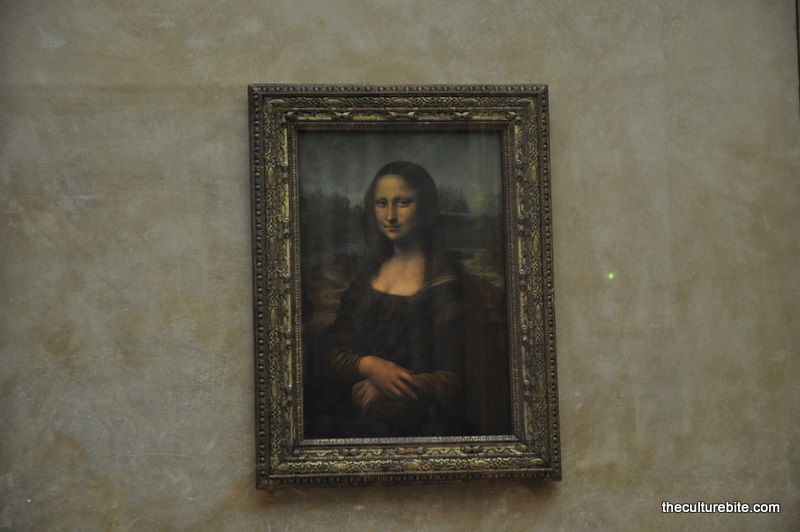 Mona Lisa – No explanation here. It’s the Mona Lisa! It’s probably the most celebrated piece in the Louvre, and there’s no doubt judging by the crowd of people surrounding the painting. The size of the painting is much smaller than I expected and the colors were a dull as well. I wasn’t as excited as I thought I’d be, but it was still very cool to see it in person. The Hall of Mummies – I actually don’t know if there’s a real name for this, but they have a room dedicated to mummies. So cool! I’m very fascinated with Egyptian history and I even have plans to travel to Egypt in the next year or two. In this room, they have several different mummy cases on display. 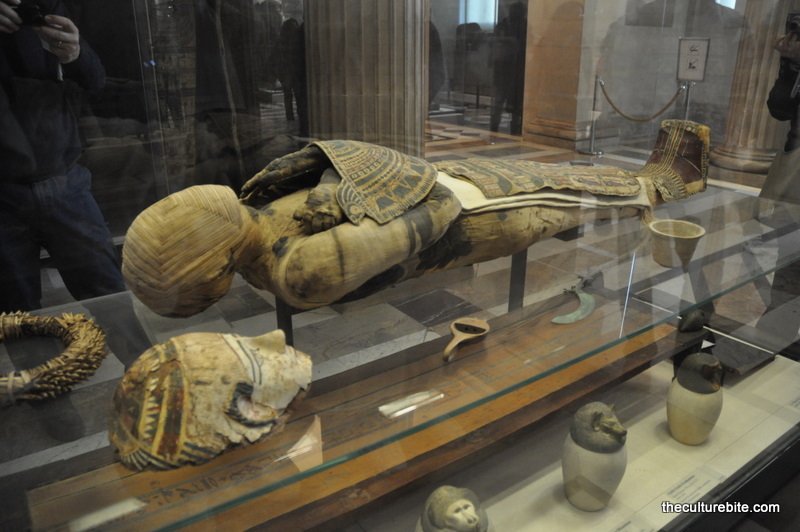 At the end of the hall, they even have an actual Egyptian mummy enclosed in a glass case. 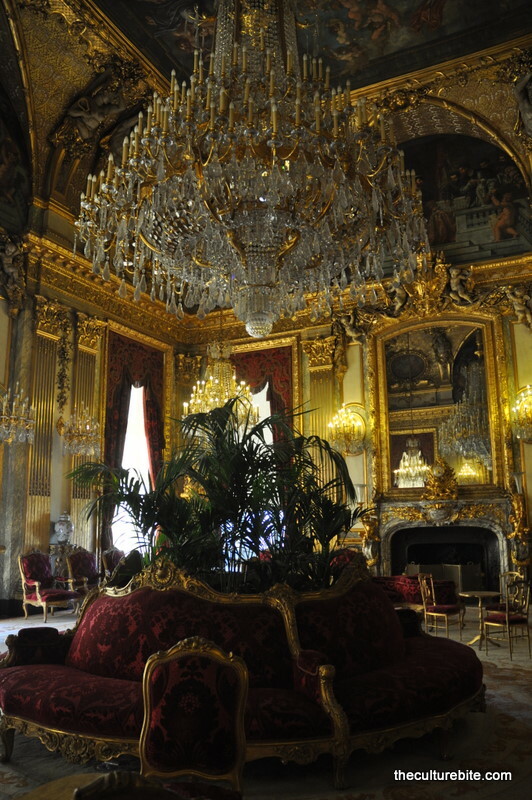 Napoleon’s III Apartments – In the Richelieu Wing at the Louvre, there are a several rooms on display where Napoleon III, the first president of the French Republic, used to live. This is not on Rick Steve’s itinerary, but I’m glad we added this in because it is the most different thing to see in this museum. With painted ceilings, crystal chandeliers, and decor of gold, marble, silk and velvet, it’s amazing to see these rooms in such good condition. The Louvre has a few cafes, but they can be expensive. 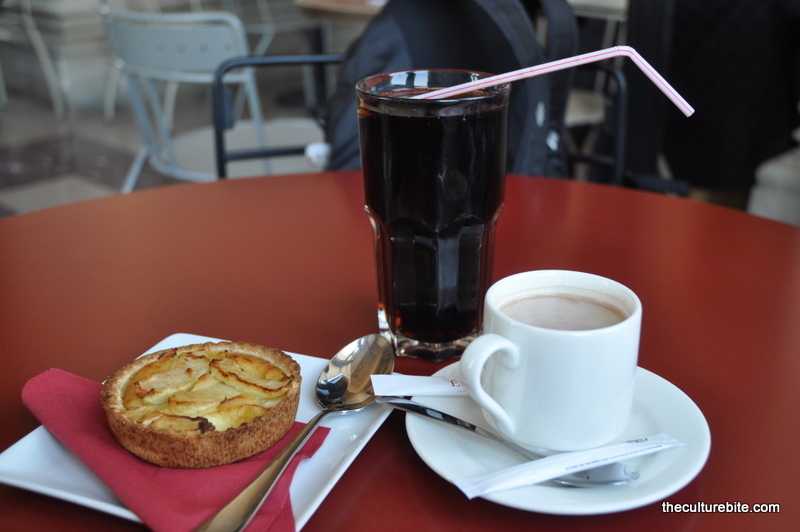 We did take a break in the Louvre for an apple tart, a coke and a cafe au lait. That was a fun experience… sitting in the Louvre enjoying a snack. 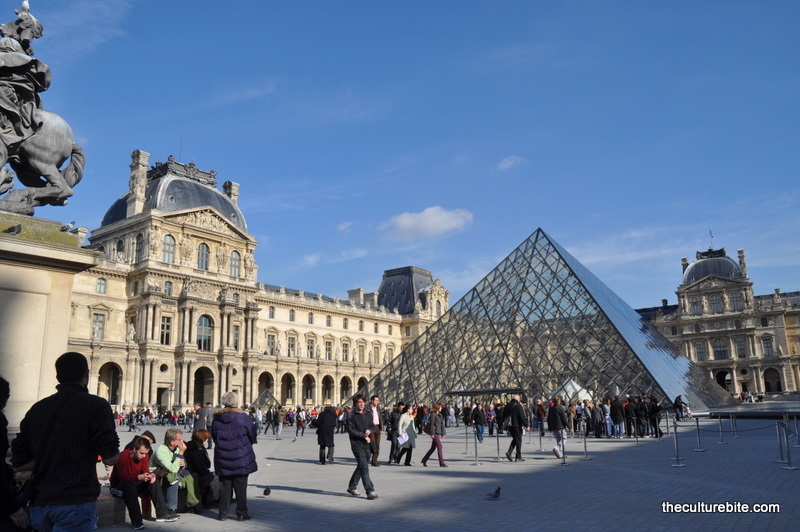 For lunch, I suggest walking over to the Carrousel du Louvre to their food court. K and I shared this Moroccan plate of couscous and chicken phyllo pastry. It wasn’t that great, but it was cheap. We still had the afternoon, so we headed off to the Notre Dame. In case you haven’t seen the Hunchback at Notre Dame, this is a famous Gothic style church sitting on an island in the Seine River. 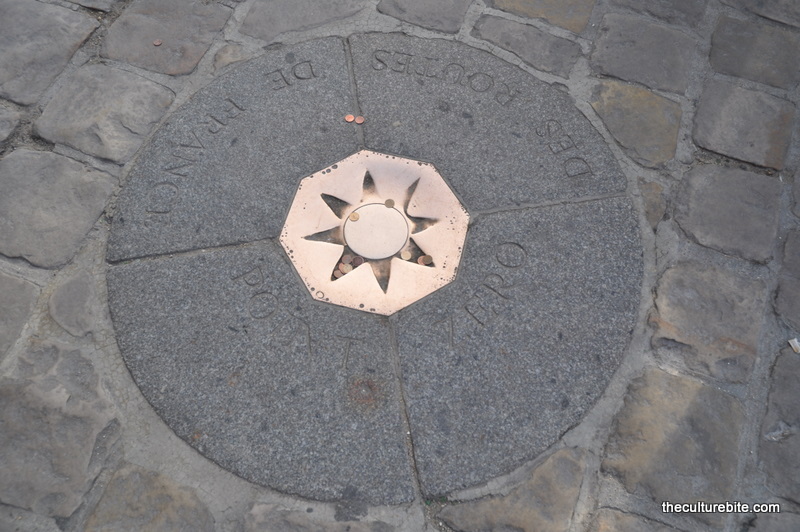 In front of the cathedral is Point Zero, the official center of Paris. Distances from Paris to other cities are measured from here. 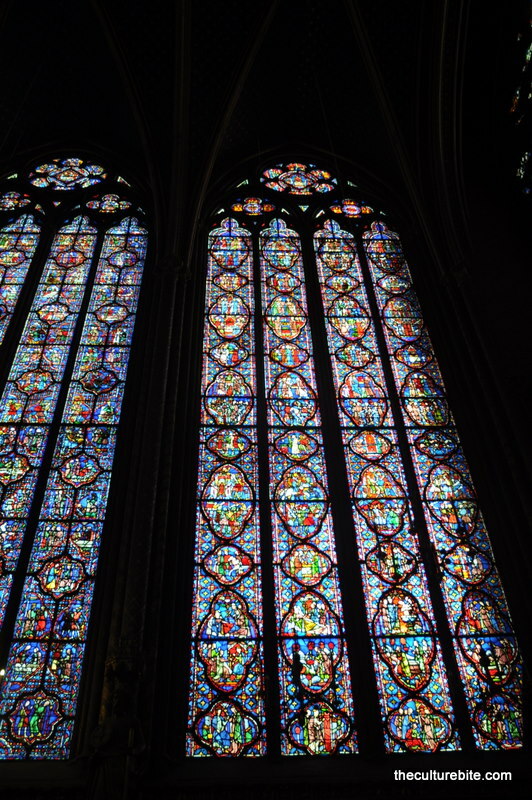 Our last cathedral of the day was Sainte Chapelle, a French Gothic church made of 15 panels of stained glass depicting more than 1,100 scenes mostly from the Bible. The glass-work is so intricate, it would take months to actually look at every single panel. Unfortunately, the stained glass behind he altar was under construction, so I couldn’t get a photo of the entire interior. The Paris pass is not accepted here, so be prepared to pay around 8 euros to get in. Hands down. This was our favorite meal throughout the entire trip. On our way back to the hotel from Sainte Chapelle, K and I stopped at a bakery and a meat and cheese shop to purchase a few items for dinner. 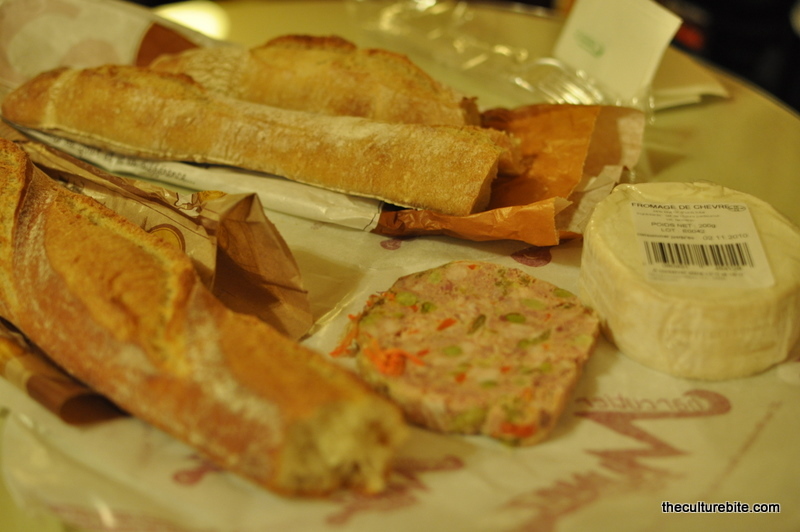 We got 2 baguettes, a slice of paté and a round of chevre cheese, a soft and mild goat cheese. We took it back to our room and devoured everything. The paté isn’t the typical paté Americans are used to. This was more like a meatloaf consisting of pork, peas and carrots and other ingredients I couldn’t identify. Sounds scary, but it was delish. The combination of the creamy cheese and the salty paté with the crusty bread was to die for. This was the most fun I had during a meal on this entire trip. The night is still young! 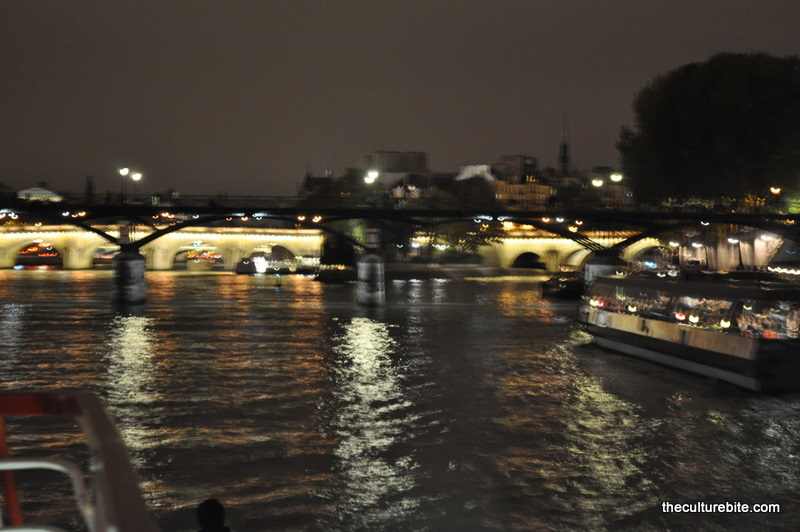 As if we hadn’t done enough already, K and I went back out to take a canal tour of the Seine River via the Bateaux Mouches cruise line. 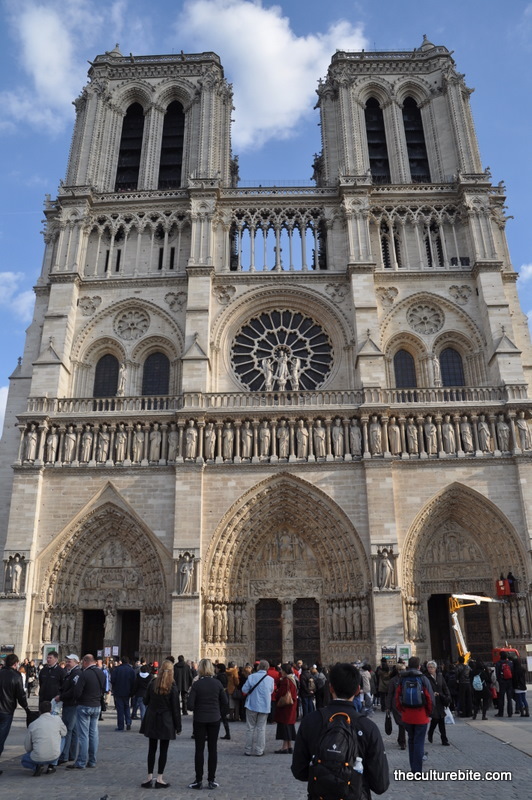 The cruise takes you on a hour long tour along the Seine from the Eiffel Tower to the Notre Dame. I suggest doing this at night since Paris is beautiful when it’s lit up. 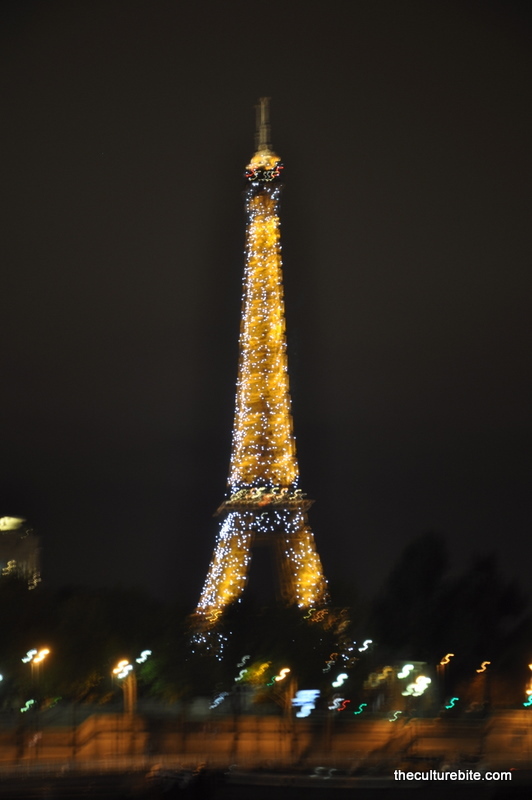 As soon as we took off, the Eiffel Tower began to twinkle as it did on our first night. Things couldn’t have been more perfect. The cruise comes with an audio tour that is translated in 10 different languages. I couldn’t really hear what the recording was saying, but it didn’t matter because I enjoyed being on the water. Best part is that this tour only costs 10 euros per person. From here, we trekked back home for a good night’s rest.